When did the idea of climbing G2 come up? Personally, climbing G2 occurred to me on my way to Roxas City (Capiz) when I took the boat trip from Manila (right just after the June 1977 climb to Mayon). The boat made a brief stopover in Romblon, Romblon and some people from there were talking about the ‘unclimbable, formidable’ peak that is G2…I’m sure others came up with the idea too. How did the expedition came to be? After the 3rd MFPI Congress & Climb in Mt. 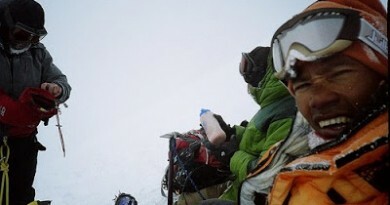 Pulag, Art [Valdez] called up a meeting and declared that an expedition to G2 will be undertaken in May that year… Art was expedition director; Mayo Monteza was in charge of food; Fred Jamili for operations; Rene Atonson for logistics; and I was the climb coordinator. From the UP Mountaineers came Buboy Francisco and his team: Kit, Kim Valino, Mon Ruiz, Bubot Torres. Did local guides join the group? We had at first some difficulty trying to ‘convince’ some locals to join us as ‘porters’. But since we had the full support of the local Mayor (Mayor Morgado), this somehow ‘assured’ the locals that things would be OK, and so I think two of them volunteered to join- one of them was BULOD after whom the ‘Bulod Spring’ was named. What is the origin of the names like Mayo’s Peak and Bulod’s Spring? On the first night at camp, we began to worry about water supply as we have NOT come across any stream, or river on the way up. By sheer luck, after dinner that night, a torrential downpour occurred and we were able to satisfactorily fill up our water bottles/canteen. The following day, Bulod found a spring source just a few hundred meters up from the campsite. We named the spring after him and the name stuck to this day. We reached what seemed to be a peak just below the main summit on the day that happened to be Mayo’s BIRTHDAY. 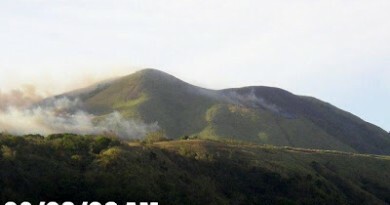 To observe the occasion, and as a ‘gift’ to him, BUBOY Francisco suggested that we call that peak as ‘Mayo’s Peak’, and the name has stuck to this day. The first attempt in May 1982 reached only up to Mayo’s Peak…what were the difficulties you encountered and how did you prepare for the successful climb the following month? At that point, from Mayo’s Peak, we surveyed the area and found that the summit may take another couple of days of which by then we would have ran out of all supplies (food / water / camp gas/ etc. ), so Art made the decision to ABORT the attempt for the summit, return to base (Bacolod / Manila), stack up more supplies, then re-group again. By this time, there were already a lot of women who came along. 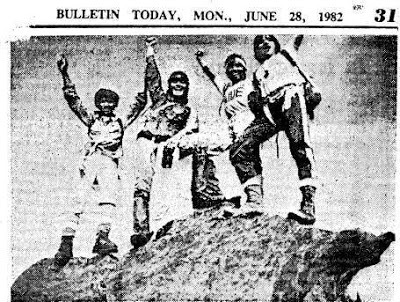 But since we were more experienced and having been there the month before, we led the way until the 4 of us made it [Edwin Gatia, Kim Valino, Bubot Torres, Mon Ruiz] to the summit of G2 at about nearly sunset [on June 17, 1982]- for the first time in the history of the mountain. What was the feeling of being the first climber at the top of G2? That night, news of the ‘conquest’ was flashed all over town, and the entire Province of Romblon, and all wire services. Mayor Morgado congratulated the team via RADIO. (this was one event where I had come to appreciate the utter USEFULNESS of radio communications. . .) While at top, I lit up my remaining light-sticks and ‘whirled’ it around. It must have been visible down below, and the towns people responded by blinking their tricycle headlights, and we could see hundreds of ‘flashes’ from them at the top. It was ‘highly exhilirating’ to say the least. I had the feeling of having accomplished something that no one ever did before! Upon our arrival at the radio base at the edge of town, there was a ‘ticker parade’ of sort that awaited us. Some of us were sitting on top of a jeepney and were ‘paraded’ around town, with a marching Band to boot!. . . we felt like ‘heroes’ on a home-coming. I swore at the time I could feel like being a Yuri Gagarin or Alan Shepard who just came back from being the first man in space! We are truly grateful for the pioneering efforts of Sir Edwin, Sir Art, and the rest of the G2 explorers who daringly paved the way for what we now have as one of the most challenging climbs in the Philippines. ← Hiking matters #27: Ivan Henares reaches Pulag summit! 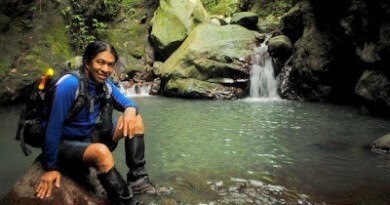 15 Comments on "MountainTalk #2: Edwin Gatia recalls the first-ever Guiting-Guiting climb"
Ask lang po if there are plans for this year to visit romblon's G2. Sir God, ask lng po if there plans for this year yo climb G2. Rolly po ito. I must apologize for having forgotten to mention one of the members of the original expedition, Luigi (sorry forgot the family name)….